Londonlov86 is quite an active member of SanrioTown and an avid player of Hello Kitty Online. Her in-game name is Isabella_10 and she is a member of the “little_one” guild. She likes to join events in the game and as you can see in her blog she joined the most recent event “The Hunt For All Game Masters”. Her Dream Studio video won as Editor’s Pick before. She also likes to talk about her time and experiences in school. She’s gonna graduate from elementary school on July 5. A graduation party will be held on her farm on the HKO International server. Aside from SanrioTown. she also visits Littlest Pet Shop Online and Club Penguin. Visit her blog by clicking HERE. Samantha or Samira is a Muslim and 13 years old. She likes “kawaii” (cute in Japanese) stuff, stars, animals and cupcakes. She’s from North Minneapolis, one of the places that was hit by a tornado recently. She has a 2-year old cat named Winx. She has type 1 diabetes and has had it for three years so she advises people to take care of her health. Soul Calibur is one of her favorite games. Oh yeah, she likes to end her posts with “bye”. Check out her blog by clicking HERE. BYE! Sara’s blog gets picked for this week! She was born on the 20th of November and likes to listen to music. She’s interested in art, technology, anime, food and… love? Her favorite animals are puppies, cows, bunnies, kitties and penguins (which is pretty obvious if you look at her e-mail address). Her favorite foods are Pocky (you can deduce that by looking at her blog’s tagline =Þ), strawberry cake, seaweed, cheese, citrus, banana, kiwi and grapes while her favorite drinks are Sprite, milk, and fruit juices. The flowers that she likes are rose, chrysanthemum, sweet pea and peony. She has a pet dog named Dieter. She’s also a Hello Kitty Online player and likes to wear a pig-shaped hat in the game. This week’s Blog of the Week spotlight goes to ong_shufen’s blog! She’s an active blogger and uses it to share her wonderful recipes with others here in SanrioTown. She got it all from many different sources — websites, friends, magazines and t.v. shows. Her posts are very detailed. It contains all the ingredients, cooking instructions and even has a screenshot of the finished product. Below are just some pictures of her “Fentastic” collection! Check out her blog by clicking HERE. 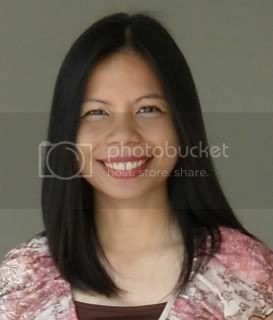 Our featured blogger of the week is Pauline. She’s 12 years old and likes to collect and play toys. She says that she’s a little tomboyish and acts childish for her age. She has entomophobia a.k.a. insectophobia or fear of bugs. She wants to be a writer someday. According to her being normal seems pretty boring unlike the wacky and crazy lives that the characters from animes that she loves to watch. She also likes playing on her Nintendo DS and considers herself some sort of otaku. Amanda N. has many nicknames. Panda, Tram, and Trammy to name a few. The last two are based on her Vietnamese name “Mai Tram”. She got the nickname “Panda” in 5th grade because it rhymes with her name and she and her friends decided to give themselves animal nicknames. She likes listening to music and considers it a very important part of her life. She loves her family and friends so much and means the world to her. Her dream is to get PhD in Economics, get a position as an assistant professor at a major research university, preferably in California. Her favorite nonprofit organization is UNICEF. She was once the president of the UNICEF Campus Initiative chapter at UC Berkeley. She’s very interested in fashion and likes show the dresses that she wears on her blog. Go to her blog by clicking HERE. The winner for blog of the week is hyperliltenshi! People often think of her as younger than her real age. They get shocked and she just laughs it off. So what’s the secret to her youthful look? Don’t use make-up, be a kid at heart and eat cookies! She’s also an avid player of Hello Kitty Online and has already rescued Hello Kitty in the game. She joins events just like the previous HKO Japan Earthquake Aid event. Her in-game name is “CC-chan”. Visit her blog by clicking HERE. Bye! Alyssa Leigh, 16 years of age, is a Filipina and now currently lives in Hawaii. She’s 147cm tall and weighs 38kg. She knows how to speak in different languages. She’s obsessed with rings and loves to watch anime and read manga. She may be what you call an “otaku.” She can write in Kanji and knows calligraphy. She also says that she likes to buy clothes and spends a lot of money on them. Check out her cute blog by clicking HERE! 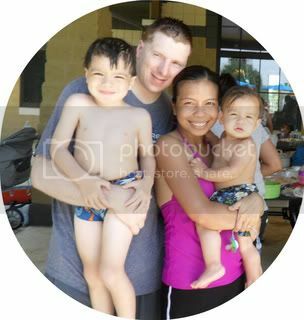 Trish, a very proud mother of two wonderful little boys, is our featured blogger of the week. She’s a Filipina and knows how to speak Tagalog, Hebrew and English fluently. She lived in the Philippines, Israel and now currently, in the United States of America. She was known as the “Hello Kitty girl” in her high school days and she was teased for it. That led her to let go of her vast Hello Kitty collection which she regrets till this day. She plays Hello Kitty Online and is known as “trish” there. She considers it as an online “Barbie” and dresses her character in various, cute outfits. Playing HKO made her realize her undying passion for Hello Kitty and she or anyone else never really does outgrow Hello Kitty! Her blog title says it all! Meet Emely, a Brazilian who also has a mix of Japanese within her. According to her, she’s a real clown who laughs and talks out loud. She’s an animal lover. She owns both cats and dogs which she treats very well and even buys them toys. She can also make jewelry and origami. She’s crazy about Hello Kitty and loves playing Hello Kitty Online with her sister. She likes to join events in HKO and wins some of them like the “Color Me Pet” event. She collects clothes and pets in HKO as well. Congratulations to Emely for being chosen as blog of the week! Check out her blog by clicking HERE. © 1993, 2009 SANRIO CO., LTD. All rights reserved.